Direct marketing and the attendant importance of forming relationships with customers have become important for many small farms looking to find ways to stay profitable, but that hasn’t always been the case. It started as a movement spearheaded by a small number of influential farms at a time when many farmers still sold their products to distributors or buyers at the stockyard. 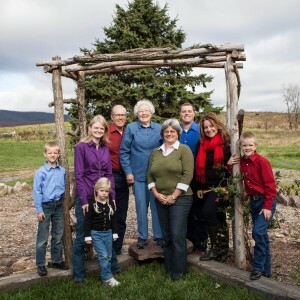 On March 2, Matt Ludwig, our project’s media guru, and I were privileged to interview one of these direct marketing pioneers, Polyface, Inc.
Polyface is a third-generation family farm nestled in the hills of Swoope, Virginia, just southwest of Staunton. 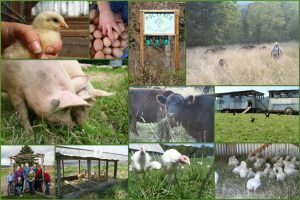 Polyface is most closely associated with Joel Salatin, the farmer, author, and speaker who made the farm famous. 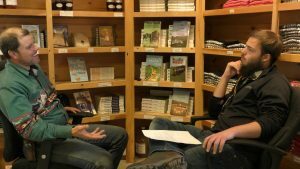 Joel has spent decades touring the country and appearing in print, film, and audio media to discuss his take on sustainable farming practices and advocate for local food systems. He has written several books about sustainable agriculture, including Folks, This Ain’t Normal and Salad Bar Beef. He has also been featured prominently in books like Michael Pollan’s The Omnivore’s Dilemma and films such as Fresh. We interviewed Joel’s son Daniel, who, in addition to his own speaking duties, now handles most of the day-to-day management of the farm. Daniel’s wife Sheri also has speaking engagements where she discusses her experiences as marketing director at Polyface. Any farm that is serious about marketing in today’s economy must proactively engage with consumers, but Polyface takes that to the next level. The speaking engagements have benefitted the farm on several levels. While primarily a way to discuss the principles behind Polyface (more on those later), these speaking engagements have also helped build the farm’s brand and drawn visitors to the farm–a major pillar of Polyface’s marketing strategy. Daniel highlighted the importance of free samples in their marketing strategy. When selling to restaurants, Polyface will often send large sample baskets to chefs so that they can taste the product and cook with it before making buying decisions. I actually happened to run into Daniel and another member of the Polyface Team a few days after our interview at a Virginia Cooperative Extension networking event in Luray -they believed in samples so much that they’d driven an hour and a half just to hand out free samples to chefs! Perhaps the most interesting point about the Polyface team is that their marketing strategy is driven by the same principles that shape their lives–their focus on personal relationships is a huge part of their brand and their lives. Activities like checking in on restaurant accounts weekly and inviting people to see the product being made help them maintain loyal customers. Living in a small rural community has a tendency to make you reliant on personal relationships, so this comes naturally to them. The Salatins have used these principles to their advantage in the business world. By the same token, their support of local food systems and pasture-raised proteins are fundamental pillars of their message, their personal beliefs, and elemental to the Polyface brand. They argue that their products are intrinsically different not just because of the discernable difference in taste and texture, but because of their positive effects on the land and community. They are farming on their terms, and they’ve excelled largely due to their ability to describe the ethos that drives them and targeting customers who hold the same beliefs. That brings me to a point Daniel made in our interview: Polyface is not trying to be the low cost producer, because that wouldn’t work for them. Consider their broilers: it costs them more to raise a chicken to market weight, process it, find a consumer, and deliver that chicken to the consumer than it would for a large, publicly held, vertically integrated poultry company. Part of the difference in cost is due to the differences in production practices, and part of it is due to the fact that Polyface doesn’t have access to the economies of scale that larger producers do. But Polyface has still flourished selling their product for a higher price. Price is a way to communicate value. Farmers looking to enter direct markets should not be hesitant to raise prices if they feel their product is better than competing products. Although the Salatins have done a stellar job making their farm business successful, not every farm can do exactly what the Salatins have done and still be successful. But despite the differences between farms, there’s plenty that every farmer can learn from the Salatins’ story, from their success in belief-based marketing to their ability to find and maintain a place in the market without having to compete with lower-cost producers. If you’re interested in learning more about Polyface but don’t want to wait on the video, feel free to visit http://www.polyfacefarms.com/ or swing by the Polyface farm store. You can also find Joel’s books and information about other Polyface media resources. Many thanks to Daniel for sharing Polyface’s story with us.